Mastro's. For me, its very name had been subject to scorn ever since a disappointing experience at Mastro's Ocean Club in Newport Coast a couple years back. Though perhaps I was a bit at fault, given that I'd ordered steak at an "Ocean Club." And I'll admit that my experience there was tainted by the clientele, which I'll describe kindly as your stereotypical Newport bunch. So after hearing many words of praise for the "real" Mastro's, I decided it was time to give her another chance. 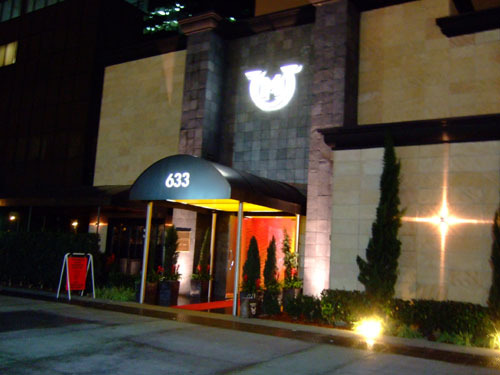 Mastro's is nestled among the group of buildings located across from South Coast Plaza. In fact, it shares a parking lot with Savannah Supper Club (formerly known as Chat Noir, of the Culinary Adventures empire). Parking is valet only; and naturally, the lot was filled with Mercedes and BMWs of all types, with a Bentley Continental GTC occupying the primo parking spot. 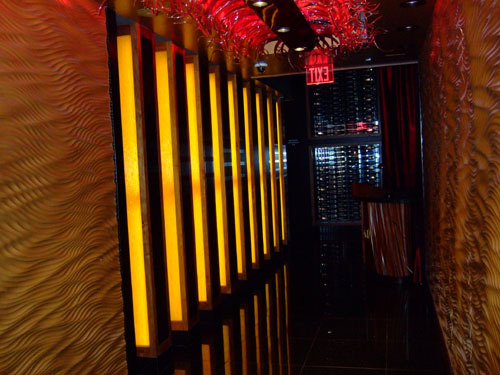 Once you make your way through the throngs of well-dressed and well-heeled diners to the door, a rather groovy hallway separates you and the hostess stand. 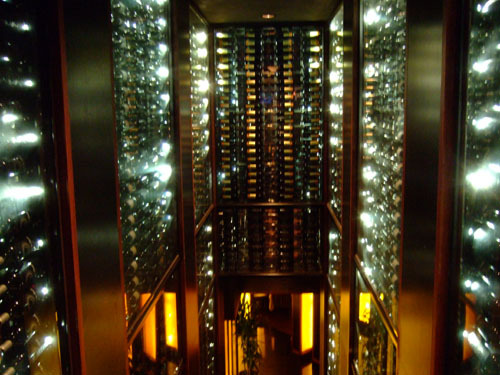 On the way to our table, we were led by one of the most impressive displays of wine I've ever encountered. The second photo shows the view from the second floor, near the private dining room and restrooms. 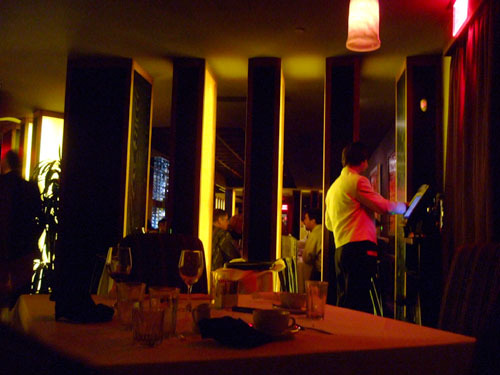 The restaurant is large, and is sectioned off into several smaller rooms. Don't be fooled by the yellowish light, Mastro's may be the darkest restaurant I've ever been to (even more so than Tagine!). In fact, this was the first time I've been forced to use flash throughout a meal, which I generally disdain. 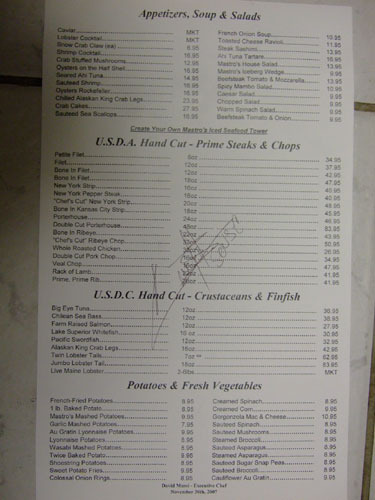 The menu is pretty much exactly what you'd expect from a restaurant like this: nothing cutting edge here, just steakhouse classics, hopefully well prepared. 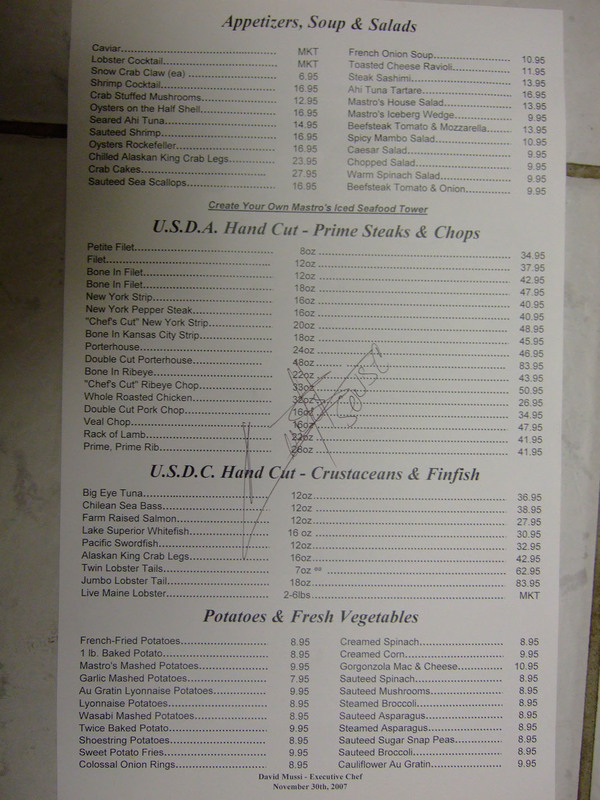 Note the signature of the sous chef (the executive chef wasn't in). 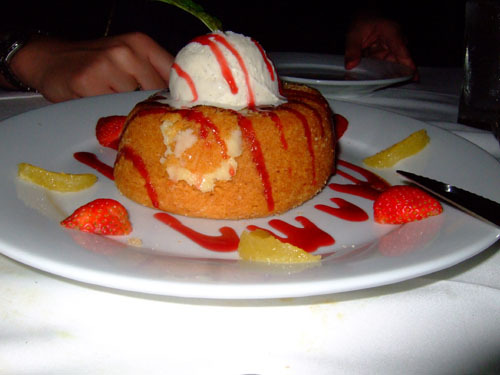 Similarly, the dessert menu is fairly formulaic as well, though the warm butter cake is Mastro's signature dessert. 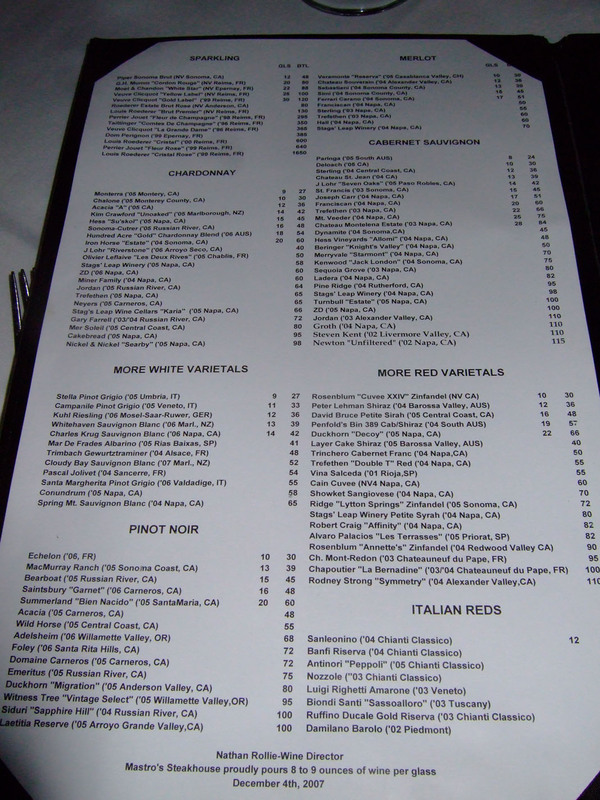 The wine list contains a fair number of reasonably priced selections, although there is a "reserve" list with the big-ticket bottles (e.g. $5,000+ for the 2004 DRC Romanee-Conti). Click for larger versions. 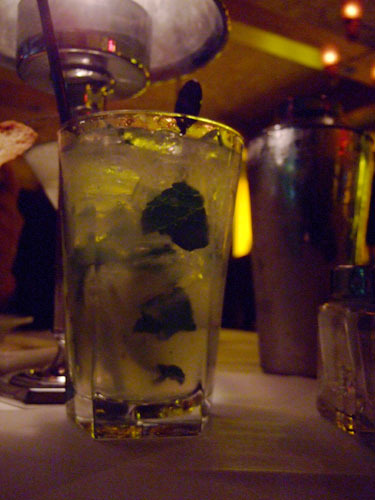 I started with a Mastro's Mojito (on the strong side, could've used more lime and mint), while my dining companion had a Stoli Elit Martini (super smooth, but pricey at $20.50) after being denied a cucumber martini due to lack of proper ingredients. Five types of bread were presented: crouton, pretzel, baguette, dinner roll, and brioche (my favorite was the pretzel). Overall, this was very nice breadbasket with good variety. The half dozen oysters were evenly split between Bluepoint (left, from the East Coast) and Chefs Creek (right, from British Columbia) varieties. I preferred the smaller Bluepoints, as I felt they had a sharper, cleaner taste to them. My dining companion, however, liked the Chefs Creeks better. Worthy of note is the horseradish provided with the oysters. Our server warned us about its potency, and calling his bluff, I immediately scooped up some with the tines of my fork. Big mistake. The sauce near instantaneously caused an intense burning in my mouth and nose, making me gag. In the words of the eminently quotable Ralph Wiggum: It tastes like burning! Mashed potatoes, scallions, ginger, wasabi. Although this really wasn't "sashimi," given that it was seared, I still enjoyed it nevertheless. This bit of cooking lent the steak a very pleasing contrast between the cool, creamy center and the slightly tougher, but flavorful exterior. I was a bit surprised at the use of the mashed potatoes as an accompaniment, but felt it worked well enough. The ginger and wasabi were not touched. Scallions, avocado, tortilla chip crumbles. I rarely meet a tuna tartare I don't like, and this was no exception. Even though the fish itself wasn't "sashimi quality," it was still tender and flavorful enough for tartare duty. 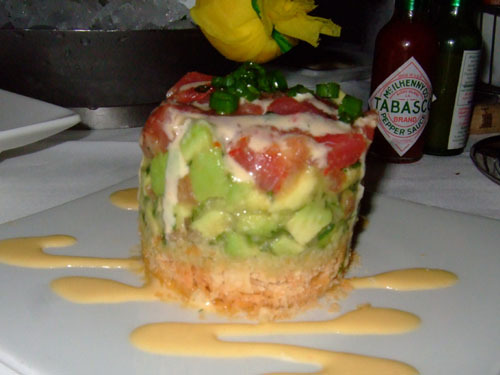 The pairing of avocado is something I've encountered many a time, but the combination still holds a certain appeal to me. What I hadn't had before though, was the addition of tortilla chips; this provided a nice mix up of texture compared to the rest of the dish. 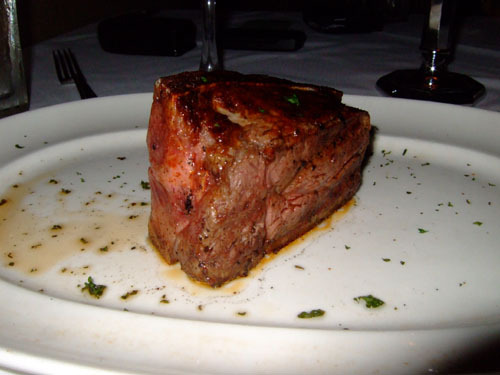 According to our server, the bone-in filet is Mastro's signature steak. It came out sizzling on a ridiculously hot plate, which caused intense burning sensations even at the slightest brush. It was one of the better steaks I've had in a while, tender yet firm, with a decent amount of beefy flavor. 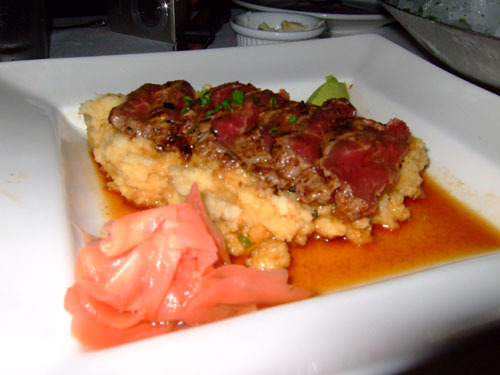 I still maintain that I prefer Ruth's Chris' filet (perhaps because it has more butter? ), but I'd say that the quality of the meat was comparable to that of Ruth's, Fleming's or Morton's (CUT still reigns supreme, though). Naturally, we needed a stout wine to stand up to the steak. The contender was a 2004 Franciscan Cabernet Sauvignon, Napa Valley. The wine was fairly intense, dry, with more pronounced alcoholic notes than I would like; overall a drinkable, though unexceptional wine. Crabmeat, Parmesan, breadcrumbs, white truffle oil. 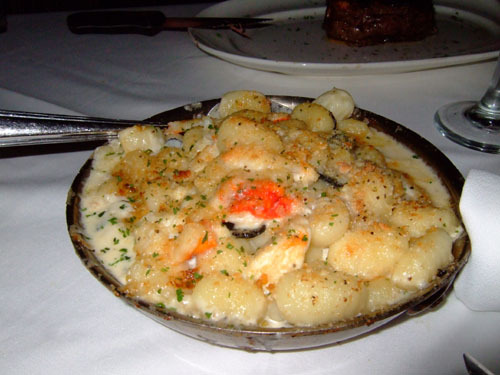 I'm not normally one to go for sides at a steakhouse, but the gnocchi (a special, along with lobster mashed potatoes, which we had at the Ocean Club) proved to be too tempting. The texture of the gnocchi themselves was not particularly inspiring, but the intense, earthy truffle essence that pervaded the dish more than made up for it. The crab was a nice addition, though unnecessary I felt. Strawberry, grapefruit, vanilla bean ice cream. The dessert menu is fairly pedestrian, except for this cake, which just happens to be Mastro's signature dessert item. The cake itself was quite rich and flavorful, though not overtly sweet. I quite liked it, especially when taken with the vanilla ice cream sitting on top. To go along with dessert, we decided to try grappa for the first time, specifically the Castello Banfi Grappa di Montalcino. Fans of Italian wine will recognize Banfi as a producer well-known for Brunello wines. Grappa is actually an Italian brandy distilled from the pomace (seeds and skin) of grapes used in winemaking. The Banfi was intense and fiery, with the alcohol covering up most clues of the grappa's grape base. I must say, Mastro's exceeded my expectations (though the bar was set pretty low). 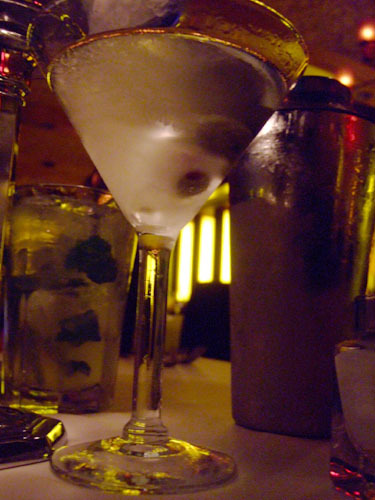 The food is not exactly inventive or creative, and the prices are a tad steep, but when it comes down to it, the drinks are stiff, the food is solid, and the steak is done right. 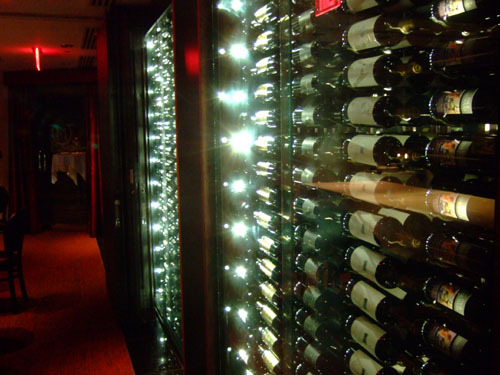 Thus, as a steakhouse, Mastro's passes with flying colors. You keep mentioning a Newport crowd. What is that? heheh I cheated I'm still on the Cs but after reading Cut I had to cheat and read on Mastro's ...I am now craving steak!!! Just eating in the dark alone would be a turn off. I love a wonderful steak, and very much enjoyed Fleming's recently, but will try Cut before I try here. 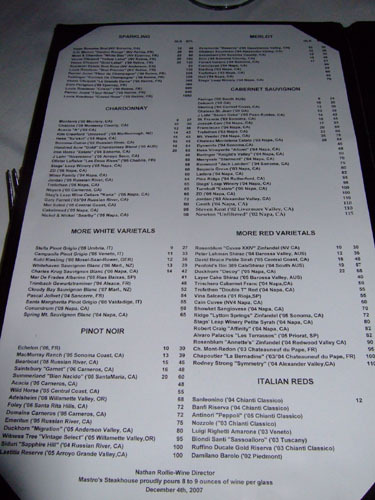 Interesting, I would put Flemings above Mastros. Just enjoyed the flavor of Flemings fillet a little better. 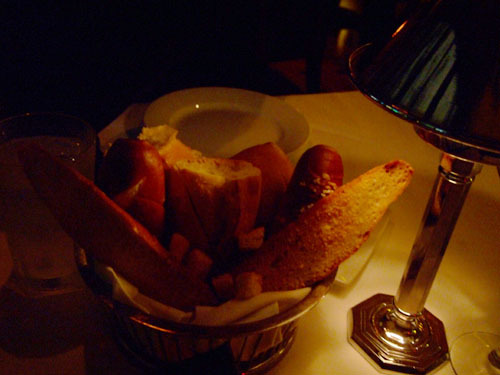 Flemings side dishes are all excellent. I also like how they bring you your own little shaker to refil your martini with the extra that didn't make it in the glass the first time. But I agree Ruth's, Flemings, and Mastros are all in the same ball park. And Ruth's butter is great. Oh and something else that really bothered me. Mastro's live music was horrendous. A real amateur trying to play jazz. I'm a professional jazz musician, and I've always wondered why fine establishments don't know the difference between good music and bad. They have people to advise them on wine, why not live music. Dave, I could see how you could prefer Fleming's. The difference between Mastro's and Fleming's/Morton's/Ruth's isn't that huge. I'm surprised to hear that they even have live music, though it sounds like they'd be wise to just stick with a CD next time. I'm not a huge fan of having music in "serious" restaurants myself anyway. Phew, this was the last post of yours I had not read, and I must say that it was a pleasure reading through all of your posts. In fact, you are the reason that I ended up eating at Saam at the Bazaar, XIV, and Brodard, and look forward to trying many more based off of your recommendations! Thanks again for all of the work you have done for this audience of yours! Wow Josh, it's impressive that you've gone through all the posts! I'm curious as to why you saved this one for last though. In any case, I'm glad that you've been going out and trying new places as a result. That's really what I hope people can get out of this blog. I viewed all of the michelin starred restaurants first, then the restaurants that were the complete opposite, and then I heard this was a good restaurant, so I wanted to leave something special for last, but I still keep up-to-date with your new posts! Ah that makes some sense. But how did you determine which restaurants were the "complete opposite" of the Michelin-starred ones? To tell the truth, I guessed based on the name, like with I Love Sushi, or anyone that I didn't recognize, but I was pleasantly surprised when I clicked on some of them, like with Capo or Studio! 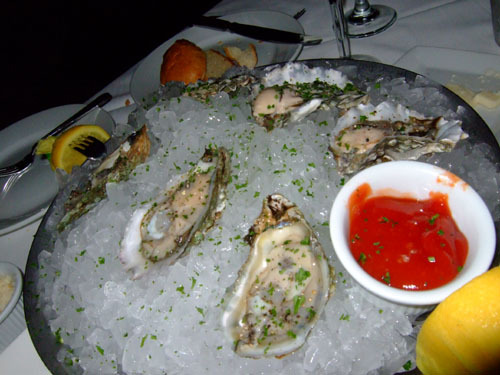 As far as OC restaurants are concerned, Mastros is the top of the group. 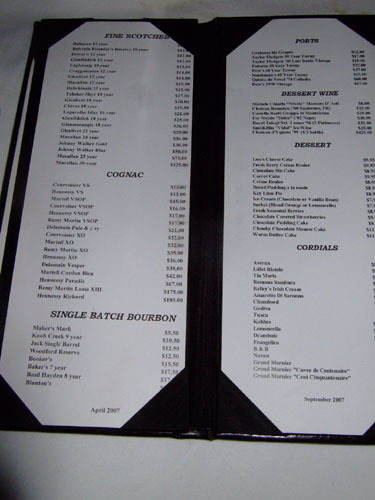 Better steak (18 oz bone-in filet), better bread selection (pretzel), better wine list (as far as I'm concerned), better appetizers (seafood tower), better side dishes (lobster mash), and better dessert (butter cake). 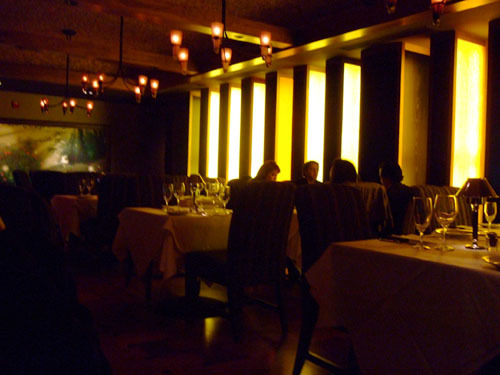 Morton's is second, Ruth's Chris is third, and Flemmings is fourth. My humble opinoin. I've eaten at all a number of times and it just seems that Mastros is a cut above.... although reading everyone's interest in Cut in LA is making me want to take a drive north. Mastro's, Morton's, Ruth's Chris, Flemmings--sounds right to me, though CUT is truly a cut above in my opinion.